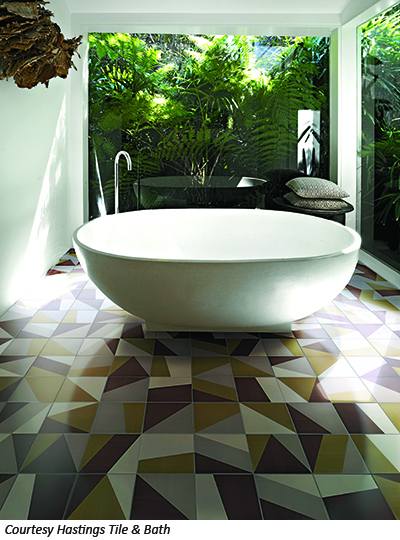 Tile trends continue to expand in a number of ways. Wood-look tile for floors and walls remains very popular, and many suggest it is tied to the homeowner interest in the reclaimed lumber look. As far as design and style, the wood-look goes with everything from rustic to the cleanest contemporary and it is the tie that binds different styles together in an eclectic whole. It can be used for an urban loft as easily as it can be used in a traditional kitchen. In addition, homeowners will find wood grain tile in both more traditional and completely surprising shapes and sizes this year. Shorter, narrower planks that were popular in the mid-century modern era are back. Daltile’s 4-in. x 28-in. offers an elegant look and is suited for use in herringbone patterns. Wood look tile is available in brick sizes, hexagons of all sizes, even mosaics. 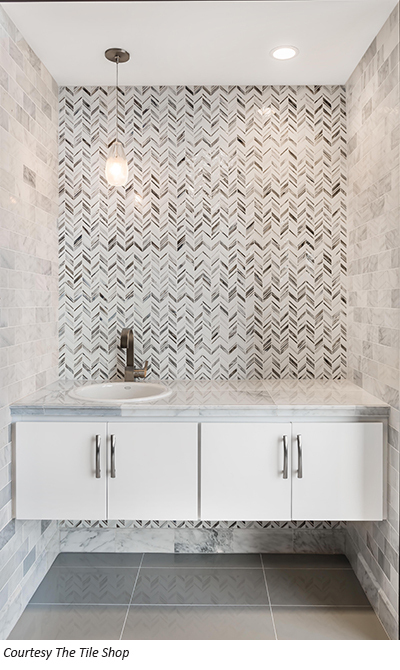 Subway tiles can be used in numerous ways including stacking them vertically and using them in chevron patterns. “In the last few years we’ve been experiencing the large format floor tile go from the popular 12-in. x 24-in. to 18-in. x 36-in.,” says Gina Hewlett of Louisville Tile. 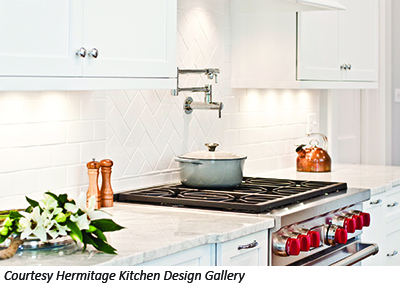 “Up until about six months ago the white subway tile was a request all day, everyday. 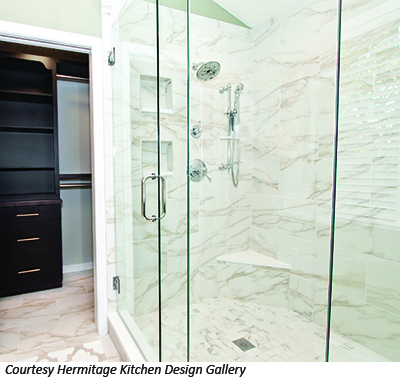 According to Carla Taylor of Hermitage Kitchen & Design Gallery painted floor tiles are one of the newer trends. 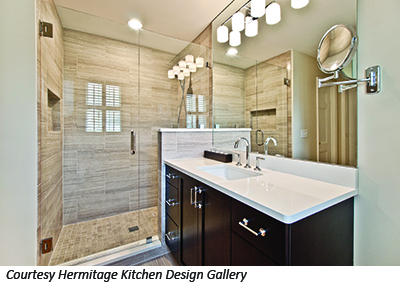 In agreement about larger tile size, she adds that Hermitage designers are using a lot of 12-in. x 24-in. tiles, not only for floors but also for shower walls. 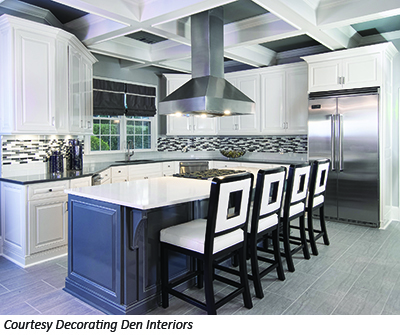 Agreeing that large tiles are popular, Bohnne Jones of Decorating Den Interiors. 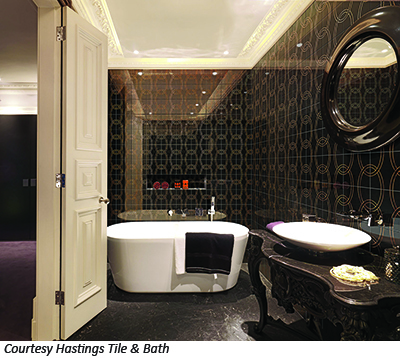 “The larger tiles are most popular in rectangular shapes, versus square, for flooring. Larger tiles give a nice, clean modern look to a room. Wall tile doesn’t have to be as durable as floor tile, so ceramic tile are still popular and can be very colorful.” She adds that the use of digital printing on porcelain tile offers an amazing variety of looks mimicking natural stone, fabric, and other interesting patterns. “And of course natural stone is also available in tiles,” she says. Camille Ervord Jacky says that the wood look in tile is still the big trend, and points to the large selection available in the Florim showroom. Florim tile is made in Clarksville and more than 30 collections are available in a variety of colors ranging from grays and tans to woodtones and traditional stone tile patterns and shades.